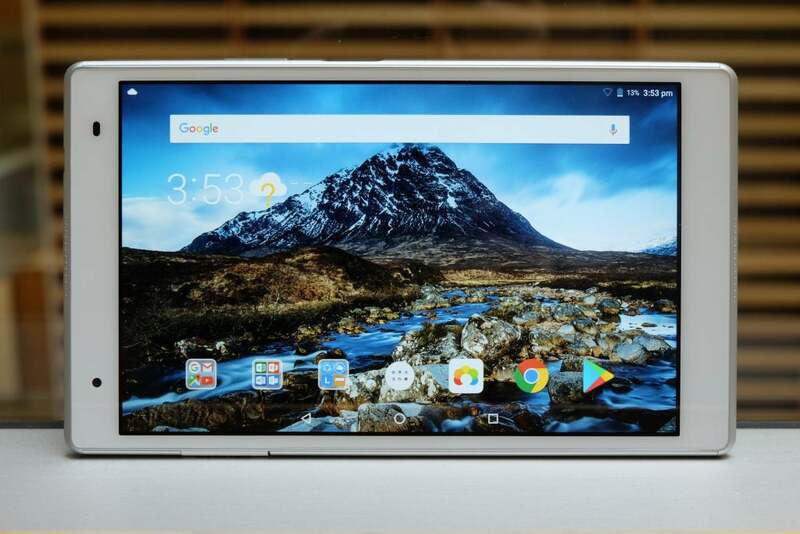 What is the Lenovo Tab 4 8 Plus? Fans of the iconic Nexus 7 tablet have been calling on Google for years to resurrect the miniature slate. But until we finally see a new version of arguably the single-most ‘fantastic’ tablet running Android, we’ll have to accept the alternatives. One of the better choices is Lenovo’s Tab 4 8 Plus. 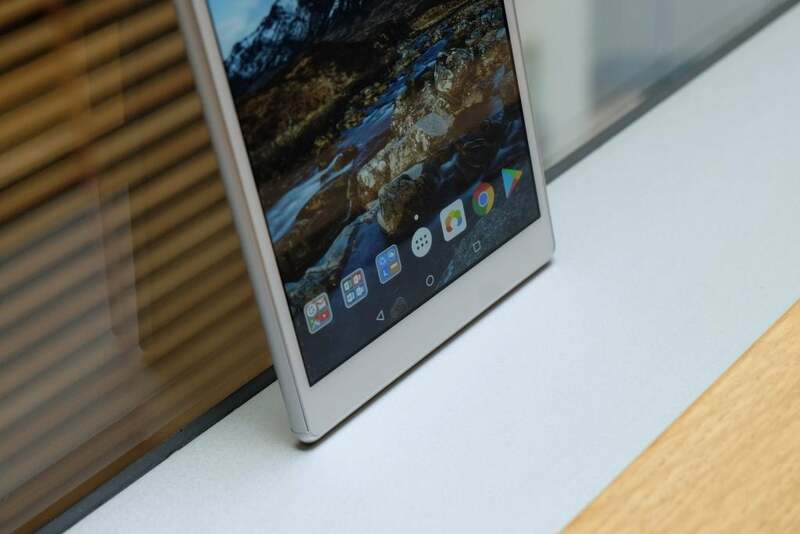 It’s a compact tablet that’s perfect for throwing into a bag for your daily commute or a flight, and at £200, it won’t break the bank. Like its larger sibling, the Tab 4 10 Plus, the 8 Plus design isn’t based on an iPad. Instead, it features a full glass-covered front and rear, with a metallic rim running between the two. My review unit was a silver/white combo and it seems to be the only readily available option currently. I’m a fan of the glass back, but I’m not sure it’s always the best fit for tablets. One drop on a hard floor could easily result in a shattered panel. For a device I often just slip in my bag without thinking twice, it possibly isn’t the best. If this tablet it likely to be used by a child, or even if you’re a clumsy adult, you’d be wise to invest in a case or sleeve. Around the edges of the device are a headphone jack (yes, Huawei, these still need to be on tablets), a flap for a microSD card and a USB-C port for charging. There’s also a lock button with an integrated fingerprint scanner. This button is very similar to those used by Sony on its Xperia devices, with a very flat surface. Combining the lock and fingerprint into one button is smart: one press unlocks the device and takes you to directly to the homescreen. 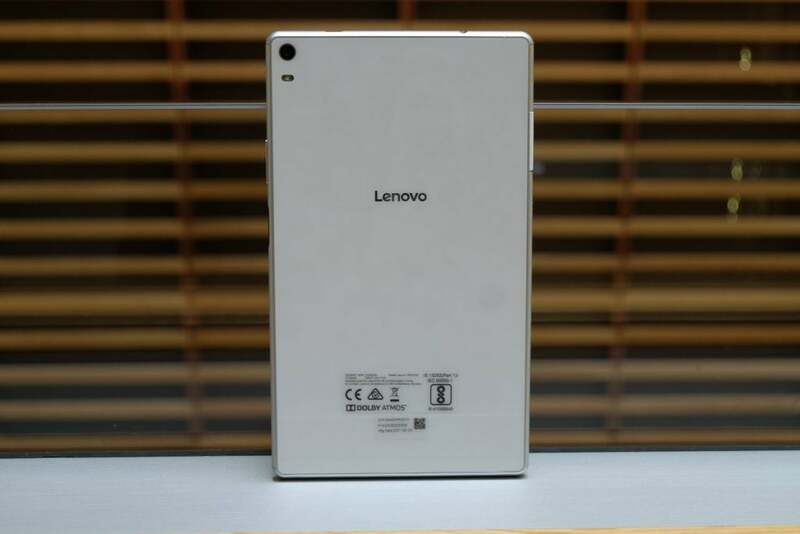 As the name suggests, this Lenovo tablet has an 8-inch display. The 1920 x 1200 resolution isn’t the highest out there and can’t match the iPad Mini. Still, it’s a decent IPS LCD panel offering up bright colours and good contrast. If you go looking, you’ll be able to spot the individual pixels in the panel. From further away, though, it’s fine. Watching movies from Netflix is a good experience, and even when I used the tablet outside for reading, there was enough brightness to combat the rays. There’s no support for fancy new standards such as HDR – you’ll still need to pay top dollar for this. Cheap tablets are often letdown as a result of poor performance. The use of low-end mobile chips paired with a bigger screens can lead to lag and a poor experience overall. Amazon’s Fire tablets – albeit much cheaper – are constantly plagued by such issues. Inside the Lenovo Tab 4 8 Plus is a Qualcomm Snapdragon 625 chipset paired with 4GB of RAM, and this combo makes for a smooth and mostly quick tablet. It’s on a par with a lower-end phone in my opinion, so you’ll have no problem with the majority of tasks. Watching Netflix videos, knocking out emails in Gmail and web-browsing are all done with ease. It’s sufficient for gaming, too, with titles such as Asphalt 8 playing with only a couple of dropped frames. Loading times are noticeably slower than higher-end tablets such as the iPad Mini, however. Dolby has helped tune the speakers and there’s a good hit of volume if you’re watching music without plugging in a pair of headphones. I’m far from the biggest fan of tablet photography, even on smaller tablets such as this 8-inch version. 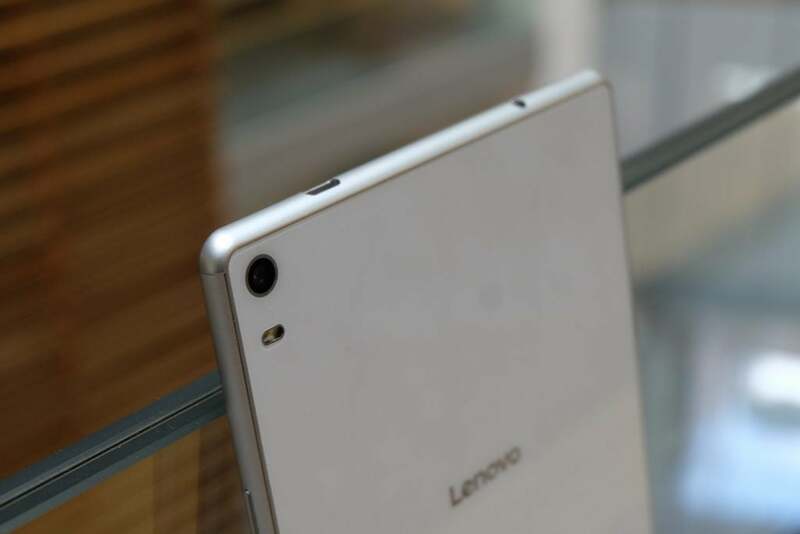 In an ideal world, Lenovo would have ditched the camera and replaced it with more storage. This is probably never going to happen, though. The rear-facing 8-megapixel takes average snaps in bright sunlight, but very little else. There’s a 5-megapixel camera around the front, too, and this is fine for video chats. The tweaked version of Android 7 running on the Lenovo Tab 4 8 Plus is very much like a super-sized phone UI. Lenovo hasn’t made too many alterations to stock Android aside from adding a few new icons and, of course, a bunch of its own apps. Apps themselves display just like phone apps, even if they do have a tablet version available and it often doesn’t feel like they’re making proper use of the 8-inch display. Android just doesn’t fit tablets as well as iOS does. Lenovo has installed the Microsoft Office suite for you, which is fine since it’s actually rather good, along with some more useless apps. Thankfully, there isn’t a load of bloatware here. Also, unlike on Amazon’s Fire tablets, there’s proper access to the Google Play Store. My biggest issue with the software is updates. This tablet is still running Android 7, which has already been superseded by Android 8 Oreo. To makes things worse, Android 9 P is arriving in only a few months. Whether Oreo or P will come to the Tab 4 8 Plus remains to be seen. Tablets, unlike phones, are devices that are meant to last days rather than requiring a charge every night. During my time with the Lenovo Tab 4 8 Plus, I found the battery life to be pretty much as I’d expect of a smaller tablet. The 8 Plus isn’t an endurance king; it’s probably more comparable to a large phone rather than a large tablet. The 5000mAh battery is a bigger unit than you’d see in a phone, but you also have that larger screen to take into account. If you use the tablet to read a book on your commute, maybe to watch an episode of Netflix in bed and for a bit of browsing, you should comfortably get a few days of use before having to reach for the charger. Like most tablets, standby time is decent. Leave the device in your bag for a week and it will still have juice when you come back to it. There’s a USB-C port along the bottom edge for charging, which doesn’t seem to integrate any form of fast-charging. Why buy the Lenovo Tab 4 8 Plus? If you’re not keen on the iPad Mini, find Amazon’s tablets too restrictive, or aren’t prepared to pay for Huawei’s more luxurious MediaPad, then the Lenovo Tab 4 8 Plus should happily fit the bill. The post Lenovo Tab 4 8 Plus appeared first on Trusted Reviews.